Online Business Intelligence Software usually consists of a suite of tools to retrieve, analyze and report on data that has been collected by a business. These business intelligence tools usually consist of data mining, decision engineering, market projection, spreadsheet and digital dashboard software. The Business Intelligence Software here is offered under the SaaS (Software as a Service) model, meaning that the software is web based, hosted on the Cloud and can be accessed when needed through a client or web browser. 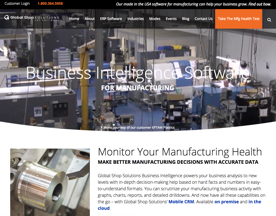 If you’re looking for similar online software like Business Intelligence Software, consider our Business Management or Business Process Management Software categories.